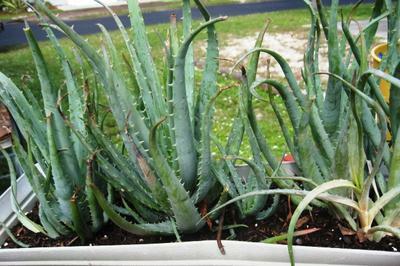 This is one of the most popular genus of succulent plants, and one which many people are familiar with as a burn remedy and skin conditioner; you'll recognize Aloe vera which is a close relative to this one. I think this could be Aloe cilaris, which you can find on this page: Aloe succulent plants and you'll find more about these great plants here: Aloe plants. The flowers are dangly little peach, orange or pink bells on a long spray, generally at the end of the summer, and do indeed attract hummingbirds. Enjoy your bird attracting flowers!